With a combined population larger than that of the EU or NAFTA, economic integration of the ASEAN states will have a massive impact on both the Asian and global economies. This book examines the ASEAN Economic Community (AEC) and its opportunities and challenges. It looks at the impacts of economic integration, trade structure and economic interlinkage among these countries through case studies. The book also utilizes theories to further examine areas such as trade, cross-border infrastructure, border management, and the regional development in terms of trade liberalization and foreign labor. 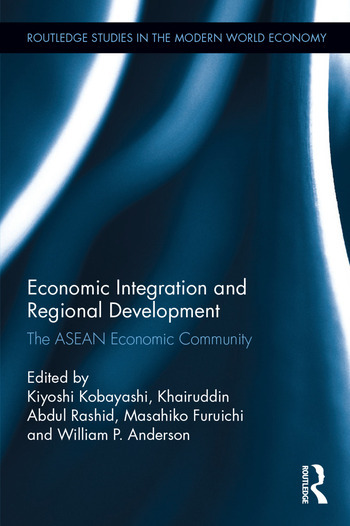 This book also provides insight and analysis to developing policies for "ASEAN Connectivity". Given the challenges faced and huge potential impacts of the AEC’s cross-border project, this book will be of interest to policy makers, business leaders and researchers in the ASEAN region and throughout the world. Kiyoshi Kobayashi is Professor, Graduate School of Management and Professor, Department of Urban Management, Graduate School of Engineering, Kyoto University, Japan. Khairuddin Abdul Rashid is Head, Procurement and Project Delivery Systems Research Unit and Professor, Kulliyyah of Architecture and Environmental Design, International Islamic University Malaysia. Masahiko Furuichi is Professor, Graduate School of Management, Kyoto University, Japan. William P. Anderson (Bill) is Director and Professor, The Cross-Border Institute, University of Windsor, Canada.